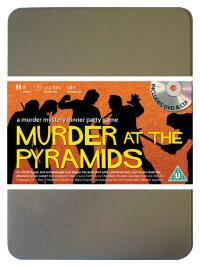 You've been invited to play the role of MUSTAFA GHANDA in Murder at the Pyramids. Egypt, 1924, and archaeologist June Digger has made the most incredible discovery of the century. Friends and luminaries have gathered to witness her findings but before anyone can say “Tutankhamun”, June is found dead, killed with a poison dart shot from a blowpipe. This was no curse, this was murder! Host your own party to find out who snuffed June’s candle! Government Official (he has to oversee everything!) Costume Suggestions : Wearing a pale suit and Fez hat, you’re the epitome of Egyptian officialdom, especially with your narrow moustache shaved through the middle. You’re often seen making official notes with your clipboard and pencil and you always have a pair of binoculars to hand if you need to take a closer look. I’m the government official for tourism and trade in the town of Bairo. It is my job to encourage tourists to visit the area’s wonderful attractions – such as the magnificent obelisk of King Dong and the twin pyramids of Queen Bah’Zouhkas. I have been extremely busy lately organising a government exhibition in which the golden bust of Queen Priti-Titi will have centre stage!